YPS publisher majordomo, Cathi-next-door often tries to educate me with one of their ‘self published’ books. In this case it was not life changing as were the books from Dr. David Grimes. I don’t even like chillies unless they are very mild! When I grew a high yielding single plant a few years ago it gave us enough chillies for two years and that was too many for me! I do love sweet peppers and we had a minor domestic whether Jason’s fine book explained how to grow them too. It does, the methods are exactly the same. Pity the title did not inform Brenda of this - the confrontation induced me to drink an extra glass of wine beyond my self imposed ration. Before I go further let me say that Jason Nickel’s, book is a very good read. It is an essential item for any chilli lover who wishes to grow his own, or merely wishes to know the best ones to buy and how to prepare and eat them. Jason has grown chillies commercially all his life and is a recognised expert who the media consult whenever they want authoritative information. His book embarks and succeeds on a difficult line. 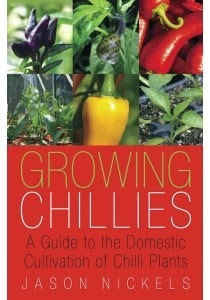 The book is written as a complete guide to growing peppers and chillies. In addition to appealing to someone with no horticultural experience what-so-ever, it is also a rich source of information for the good gardener who wants to glean professional insights in advance of those offered in the popular gardening press. Even if you want to grow something under glass other than chillies and peppers, much of the cultural information is as relevant as that you would learn on a college gardening course. My first experience with chillies was fifty years ago when I taught at the Lancashire College of Agriculture and Horticulture. We grew and sold edible Capsicum annua as a house plant as an alternative to the poisonous Solanum capsicastrum, the winter cherry. Much to our surprise most of the sales were for eating! At that time there was zero commercial production of peppers as an edible crop! I have a memory - I hope it is a false one - of advising a potential producer that pepper production had no commercial potential! I remember twenty years ago when I was consultant to a stately home garden, the poor gardener was suddenly informed he would have to produce peppers for 150 guests later that year in September for a special occasion. “How nice to produce one’s own peppers and impress the guests”. Did they not realise the vast cost this would be? Did they not care? I only started to grow sweet peppers three years ago. Why should I when they are so much better from Aldi, where they have been produced in warm sunshine and tropical light? I now grow some for ‘the hell of it’ and Brenda allows me to sow seed which litters our warm conservatory in March! I find it quite galling that she often turns her nose up at my perfectly good rather green peppers. I grimace when I look in her shopping basket and see bright yellow, orange and red. 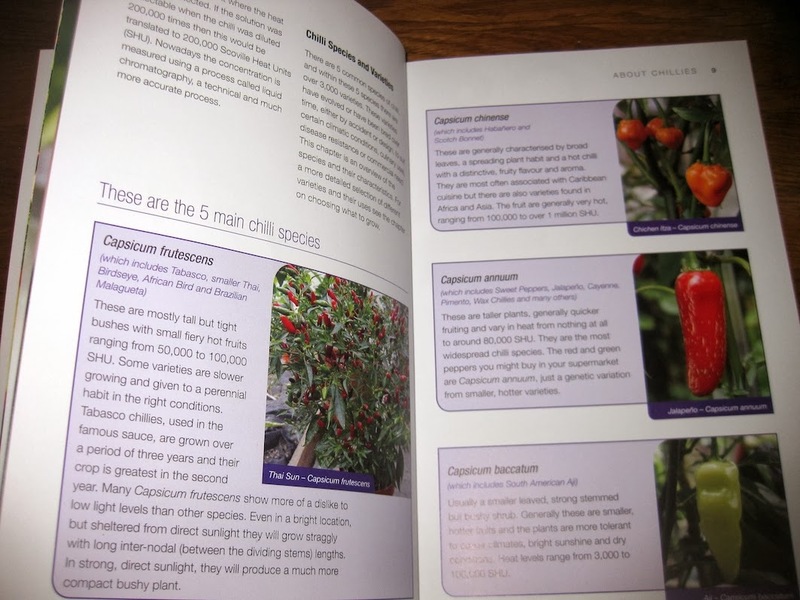 'Growing Chillies' is a beautifully illustrated paperback, the colourful pictures are Jason’s own. The layout lends itself to read like a book or to use as a reference. Equally suitable to amateurs or professionals it is mercifully brief when it gives information about commercial aids like automatic watering systems, hydroponics and artificial illumination. Actually for those souls who possess artificially illuminated propagation facilities, chillies will hugely benefit when propagating very early. Some gardeners love to play at being commercial growers with inappropriate gadgets. They will love these small sections. To my surprise Jason favours loam based compost. Although he comes from a different direction to me - his dislike of peat for environmental reasons, I do agree that loam based compost has advantages over many of the poor quality loam-less composts often offered today. The book is particularly good on cultural details and environment control. Sadly he repeats the old canard about water on wet leaves acting like a magnifying glass. He even describes symptoms! I am often set back when an acknowledged expert says silly things.There is no picture, Jason, have you ever actually really seen it? That is not to say that bright sunshine on previously shaded leaves coming from an amateur’s ill-illuminated propagator will not scorch in full sun and the book shows an excellent picture of this. Indeed it provides many excellent and helpful illustrations all round. I did find a number of items of helpful information for my own unheated greenhouse crop. In the cold British climate he emphasised choosing varieties which mature quickly. I ordered Poseidon from, to me, newly discovered, 'Mole Seeds' a month ago, Their large packet will enable me to take Jason’s advice and if my germination is poor in late February I can sow some more! I have never stopped or pruned my peppers but vaguely assumed this was wrong. I now know I am doing the right thing. The book also confirmed that in generous sized pots like mine I will have larger plants and bigger yield. Jason even mentions that unless you need to conserve precious early season heated propagation space by potting in small pots, you can go the whole hog and prick out straight into final pots. (Be careful, it is much more challenging to water properly small plants in large pots). That is the sort of gardening advice you do not get every day. Thank you Cathi for this excellent book. Perhaps, like the good doctor Grimes it is life changing after all. Perhaps Brenda will actually use my peppers this year! My 'Mole Seeds' arrived last week after a very short wait of seven days. I was most impressed with the large generous protective-sealed packets. I sowed a little earlier than usual for me on 16th of February and sneaked a drainage tray holding a dozen two inch pots into our warm conservatory. There has been no protest yet, but there may be when I soon do the same with my tomatoes! I have sown one or two seeds in each pot and with luck I will be able to put out and pot on peppers in my unheated greenhouse on April fool’s day. Update My pepper crop that year was my best ever. Brenda grudgingly used most of them and Cathi was ecstatic at the ones I passed over. Thank you Jason. I am still waiting for your evidence! Thank you Jason to your sporting response to my ungracious remarks. Perhaps I should have written that it is always worrying when an expert says silly things because he might be right! I have nailed my colours to the mast that droplets acting as a magnifying glass is a myth and have added a link in the main article to my previous post on this. I will be very interested in your experiments. It would be quite exciting if you could really show a burning effect. I do not doubt that water on the leaves can cause unwanted symptoms, it’s just the cause that I dispute. I would be interested in the website that does refer to droplets at a distance on hairs causing scorching. Perhaps in your tests it might be possible to observe and photograph droplets on plant hairs above the leaves where it might be plausible for them to concentrate light from a distance? No doubt you will try misting effects in dull conditions too. Please keep us informed on how you are doing and if you wanted to eventually do a post on your results that would be great. I presume the usual claim of scorch is actually short of burning which otherwise would be black! The ultimate effect of the phenomenon if it exists is a fire! Not ungracious at all, I see that it has become a popular topic among various scientists and journalists, so it will be interesting to experiment whatever the result. Maybe my examples of pitted leaves prove the opposite, that the water protects patches on an otherwise vulnerable leaf during it's first exposure to sunlight and the waxy coating that the leaf builds up as part of it's defense doesn't happen below the water droplet. We shall see. I have planted some sacrificial seeds and I will do my best to maim half of them! I can see you are giving this a lot of thought, Jason and I admire your analytic approach. Perhaps those maimed chillies won't be sacrificed in vain! I'm with you on chillies - after a bad experience that left hands burning for several days - could have been worse - I was totally put off. Not only was it an unpleasant few days but if it did that to my hands what did it do to our insides? Sounds a painful experience Sue. I have stupidly rubbed my eyes after handling them! They don't half water. (Even worse I sometimes handle euphorbia and forget to wash my hands). I'm a bit of a chilli fan. I grow habanero, tabasco and cayenne hybrids. Sue, how ever did you burn your hands?! If you have very thin skin or eczema then some surgical gloves may be in order when handling anything hotter than cayenne. Roger, you know I am a dedicated chilli fan, so I'd probably enjoy this book. I like the challenge of experimenting with different types and different methods, rather than the "commercial" way of producing maximum yields. I like chillis not just for eating (though I am not keen on the super-hot ones), but also for their aesthetic (and photogenic) qualities. I thought of you Mark when I wrote it! In fact in first thoughts you were going to be in it! My understanding is that they don't do anything harmful to your insides. If the info I've read is correct, they don't burn in the same way that acid or heat burns, it's just a receptor in your mouth (and skin) that can detect the chilli. Birds don't have the same problem as we do, they can eat chillies. Because of this you can supposedly use chilli to deter squirrels from raiding bird feeders. However when we tried it, the squirrel was prepared to take the challenge, and just took regular breaks to cool his mouth down on the metal pole. We thought perhaps he needed a pint of Kingfisher. Sounds it might be worth eating a few chillies if I get a pint of Kingfisher Sarah! That also indirectly answers my question about its effect on bacteria. Sorry to see your series on Costa Rica come to an end, fascinating reading but not really much to comment on other than compliment you. I am no great lover of chillies, like yourself, but have picked up on your comment about the use of peat, it seems that today every horticultural writer and broadcaster seems to want to win "Brownie Points" by decrying the use of peat in gardening for "environmental reasons" whereas in fact there is no substitute for peat and those that have been put forward are underachievers which are also much more expensive. 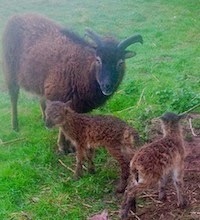 I have put this forward on my blog, but probably prior to you reading it, so I would like to reiterate that if anyone is prepared for the truth read the most informative piece I have come across, written by someone who has absolutely no axe to grind at http://www.glendoick.com/glendoick-garden-centre-details.php?PageID=57 and read the true story. 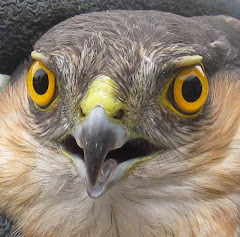 These links don't come in 'live' but it is worth doing a bit of searching to find this site. I have looked at it and like you agree with most of what it says! I will be blogging about this in due course. We live in times when lobbying and vote counting makes decisions rather than evidence. How has my Yorkshire Chilli Oil not had a mention? Interesting picture. I think I must be missing something. Will ask Brenda what its all about in the morning. I mention you in my next post, you might not be speaking to me! if true It will give the lie to my pending remark! As mentioned elsewhere chillies are too hot for me but five years ago I was converted into growing sweet peppers having previously thought that it was hardly worthwhile when they are so good from the shops where they have been grown in warmer and sunnier climbs. Like you I have surplus but your friend Cathi is pleased to help me out and Brenda this year processed some for the freezer. It is of course quite appropriate to mention sunshine to you, David! I enjoyed your latest post on its benefits!